Sorry for the absence, folks — I know you’ve been awaiting a new post with bated breath. Alex and I have been a bit busy for the past few weeks, what with a Christmas trip to Seoul, a New Year’s trip to Busan, Winter Camp woes, and tackling the Korean postal service in between. Posts about all of that and more are forthcoming, but today I discovered something of such utter importance that it warrants an immediate update. Forever 21 — aka the greatest brand to ever grace the hallowed hallways of malls across the world — was created by a South Korean husband-and-wife duo. Yes, that bastion of cheap fashion, the purveyors of sublimely trendy and fabulously hideous alike, the paragon of party dresses and trashy club wear, is all the brainchild of Dong-Won Chang and his wife, Jin Sook, who opened the first store (still called “Fashion 21”) in LA in 1984 in an effort to bring South Korean trends to Korean Americans. How have I lived in Korea for five months without discovering this sooner?! This explains so much, like: Why Forever 21’s sizes are so laughably small; why there is so much glitter and bows involved; and why I love it so much. But here’s the 21-dollar question: Why don’t they have a store in Daegu?! Show some Korean love! I don’t want to go to Seoul every time I need a cheap bedazzled accessory, t00-small stretch jeans, or weird graphic tee. 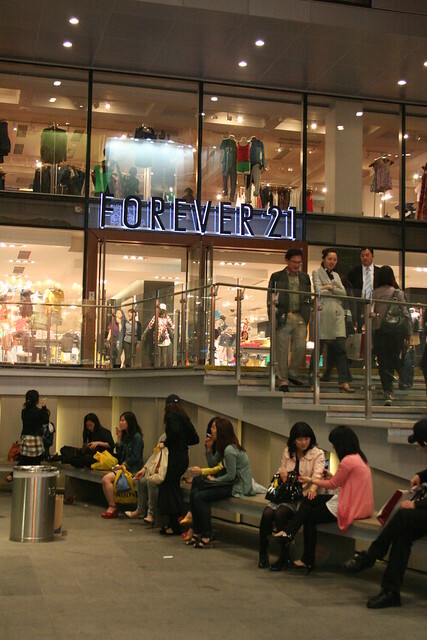 Actually, now that I think about it, all of Korea is like a giant Forever 21. I see all of those things en masse every time I walk down the street of my little Chilgok suburb, and piles of trendy junk occupy the lion’s share (fashionista’s share?) of Daegu’s largest market, Chilseong Sijang. But I’d really love it if we got one, anyways. You shop on-line or in-store? which do you like? just wondering lol.. i love in-store because i hate waiting for it to come! hey, I’m unable to subscribe for the RSS feed. Can you assist or do you know why? thanks to your info. Your RSS reader should allow you to input the website address and automatically give you RSS feeds. There’s also a RSS feed button near the bottom of the links. Previous post New airport train opens, Daegu to Incheon Airport in just under 3 hours!